Lexington, KY - April 11, 2017 - Olympic Gold and Silver medalist Michael Jung of Germany, the two-time defending Rolex Kentucky Three-Day Event champion and winner of the 2016 Rolex Grand Slam, heads the list of top riders, including Olympic, World and European champions, entered for the 2017 Rolex Kentucky Three-Day Event, Presented by Land Rover. Known as the "Best Weekend All Year," the Rolex Kentucky Three-Day Event returns to the Kentucky Horse Park in Lexington, April 27-30.
ofcompetitors, with some ridersentered with up to three horses, who will vie for top honors. The entry list includes 69 riders representing 9 countries: Australia, Canada, France, Great Britain, Germany, Ireland, Mexico, New Zealand and the United States. The top names joining Jung for this year's event include Zara (Phillips) Tindall of Great Britain, granddaughter of Queen Elizabeth II; Joe Meyer and Tim Price of New Zealand; Jessica Phoenix of Canada; and U.S. Olympic veterans Phillip Dutton, Boyd Martin, Kim Severson, Lauren Kieffer, Will Coleman and Clark Montgomery to name a few. "This year's field of competitors includes some of the biggest names in the sport. These are equestrian stars you won't see at any other competition on American soil," said Lee Carter, Executive Director of Equestrian Events, Inc., producer of the Rolex Kentucky Three-Day Event. "With another increase in prize money this year, we continue to attract the world's best riders and horses, and we guarantee another week of extraordinary equestrian competition!" At stake is $400,000 in prize money, a $50,000 increase from last year, as well as a shot at the $350,000 Rolex Grand Slam of Eventing, which is awarded to any rider who wins the Rolex Kentucky, Mitsubishi Motors Badminton and Land Rover Burghley 'Four Star' Events in succession. Last year, Jung became only the second rider (along with Pippa Funnell of Great Britain in 2003) ever to win the Grand Slam. Defending Champion Jung has entered FischerRocana FST, his 2016 Rolex Kentucky winning partner with whom he also won the Team Gold and Individual Silver medals with at the 2014 FEI World Equestrian Games™ (WEG). Jung is the first-ever event rider to hold the Olympic, World and European titles simultaneously. He won the Individual Gold medal at the 2010 WEG, double Gold medals at the 2012 London Olympic Games, and three consecutive European Championships. He successfully defended his Olympic title, re-claiming the Individual Gold medal at the 2016 Rio Olympic Games. 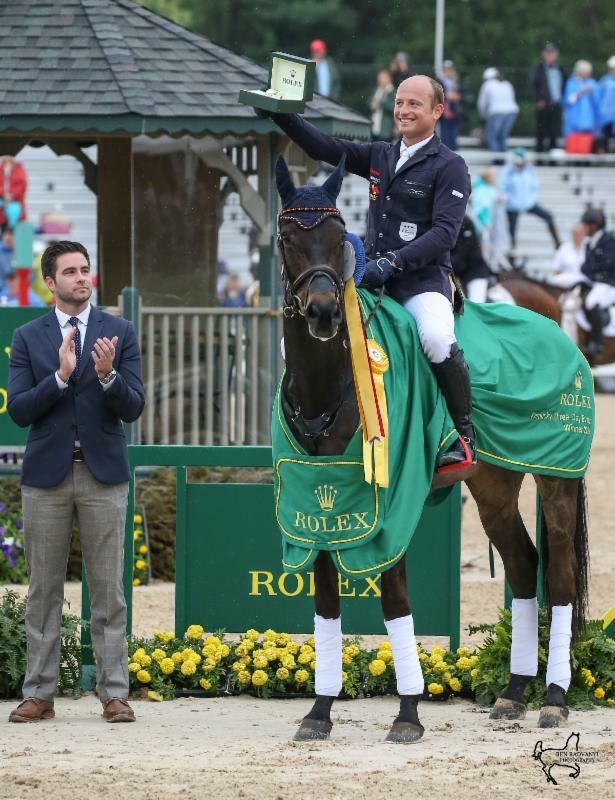 Defending Champion and Double Olympic Gold medalist Michael Jung of Germany is seeking his third consecutive "Rolex Kentucky" title as well as a leg of the Rolex Grand Slam. Zara Phillips Tindall, granddaughter of the Queen, will be making a second attempt at "Rolex Kentucky" and has entered High Kingdom, the horse on whom she won a Team Silver medal for Great Britain at the 2012 London Olympic Games and the 2014 WEG. She also won the Individual Gold and Team Silver medals at the 2006 WEG. Phillip Dutton of the U.S.A., a six-time Olympic veteran with two Team Gold medals (2000, 1996) for his native Australia, a Team bronze (2004) and Individual Bronze (2016) for the U.S.A. 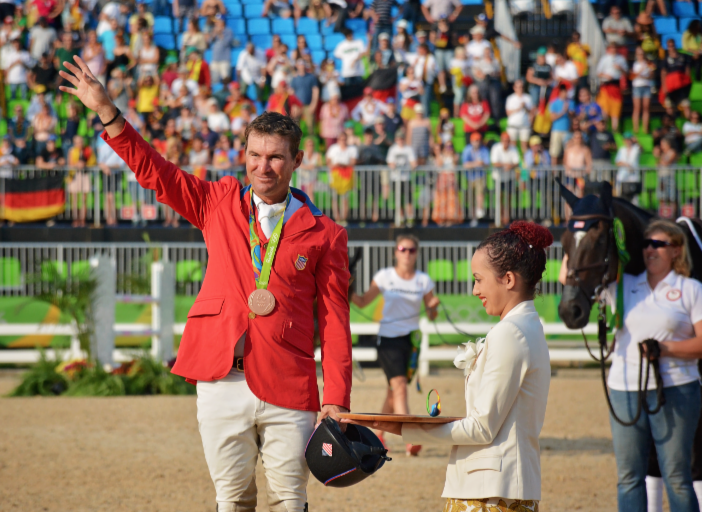 He's a six-time WEG veteran, the 2008 Rolex Kentucky Champion, as well as a two-time Pan American Games Team gold medalist (2015, 2007) and Individual silver medalist (2007). Boyd Martin of the U.S.A., a 2012 and 2016 Olympic veteran and two-time WEG competitor (2014, 2010). Team Gold medalist at the 2015 Pan American Games. Kim Severson of the U.S.A., Olympic veteran winning Individual silver and Team bronze medals (2004) and three-time Rolex Kentucky champion (2005, 2004, 2002). WEG Team gold medalist (2002). Clark Montgomery of the U.S.A, 2016 Olympic veteran. Buck Davidson of the U.S.A., WEG veteran (2014, 2010). Two-time U.S. Olympic Team Alternate (2012, 2008). Winner of the USEF Four Star Championship at Rolex Kentucky (2013). Jessica Phoenix of Canada, an Olympic and WEG veteran as well as Pan American Games Gold medalist (2011), silver (2015, 2011) and Team bronze (2015). Joe Meyer of New Zealand, Olympic veteran (2008) and WEG competitor (2006). Tim Price of New Zealand, WEG veteran (2014). Placed second to Jung at both Rolex Kentucky and Burghley in 2015. In addition to these veterans of international competition, many more of the sport's leading riders from the U.S. and abroad are entered to compete. The full list of entries is available on line at the Rolex Kentucky Three-Day Event website at www.rk3de.org/entry-list. The Rolex Kentucky Three-Day Event is the nation's premier Three-Day Event and one of the most prestigious equestrian competitions in the world. The Fédération Equestre Internationale (International Equestrian Federation - FEI), the world's governing body of equestrian sports, has designated the Rolex Kentucky Three-Day Event as a 'Four Star' eventing competition, the highest designation, which is given only to the Olympic Games, World Championships, and six annual events around the world. "Rolex Kentucky" is the only Four Star event in the Western Hemisphere. The Dubarry of Ireland Nations Team Challenge will be featured again this year, awarding $20,000 in prize money. There will be four riders per national team, and the teams will be determined by FEI ranking. Combination teams are possible where there are countries with fewer than 4 entries. This year's Rolex Kentucky Three-Day Event official charity is the Central Kentucky Riding for Hope (CKRH), located within the grounds of the Kentucky Horse Park, CKRH was founded in 1981 as a riding program for individuals with physical disabilities. Since its beginning CKRH has grown into a multi-faceted program that is dedicated to improving the quality of life and health of children and adults with special physical, cognitive, emotional and social needs through therapeutic activities with horses. To learn more about the CKRH, visit ckrh.org. "A big part of our mission here at Equestrian Events is to donate to charities both local and national, equine and human," said Stewart Perry, president of the EEI Board of Directors. "And thanks to our Rolex Kentucky fans and partners we are able to contribute each year not only to our official charity, but to a list of deserving organizations." Spectators can enjoy a world-class three-day event competition and shop at the Sponsor Village and International Trade Fair with almost 200 booths and tents. Rolex Kentucky also features tailgating, Land Rover test drives, a fund-raising farm-to-table dinner Thursday evening, on-site beer garden, 5K race on Friday evening, and Champions Live! on Sunday morning. Ticket buyers also receive general admission to the Kentucky Horse Park, America's only theme park dedicated to horses.